Q. Sometimes I click in cells and a dropdown arrow appears. I can only type in or select one of those. How do I get rid of that? A. It sounds like Data Validation has been applied. If you want to get rid of it, click on the Clear button in the Edit group on the Home tab and choose Clear All. This will clear everything. 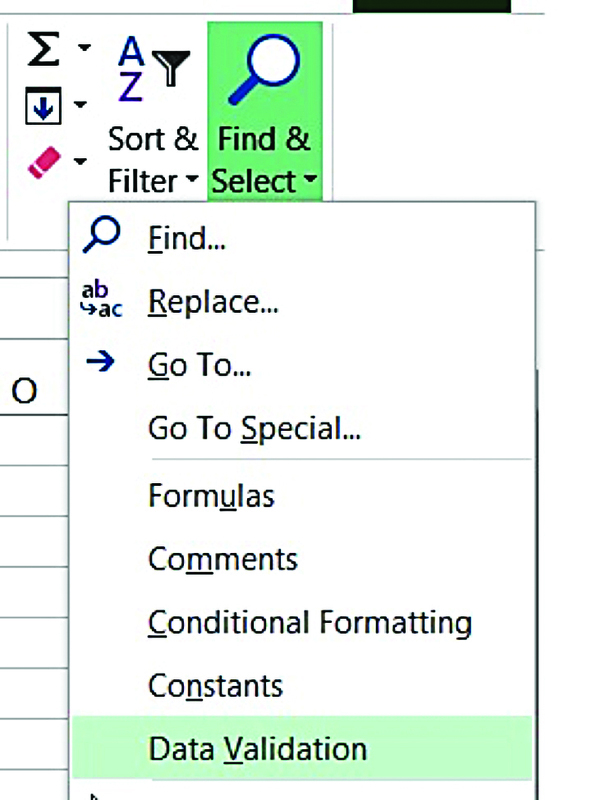 If you want to preserve data or formatting, you would go to the Data tab. And, in the Data Tools group, click the Data Validation button. In the lower-left corner of the dialog box you’ll see a button to Clear All. That just gets rid of Data Validation. If you’re not sure of all the places it has been used, click on the Find and Select button in the Editing group on the Home tab, and choose Data Validation. It will select them all, allowing you to Clear All, if you wish. Alternatively, you could just highlight those cells to be able to find them each later.